We’ll start by taking a look at how the game, in its current build, is monetized. The style is a classic Free to Play model reliant on MTX (micro-transactions) to generate revenue. This would technically be closer to a pay to play game compared to the other major F2P games like League of Legends because the MTX allows users to buy cards which can be used to create potentially better decks. Users are all given the same starting cards and obviously want to earn more cards to enhance their decks. I’ll repeat, you can purchase decks instantly for real money or earn points by playing to unlock decks. Users can earn these free points through accomplishing specific tasks (win 3 times with a specific character class to win 30 points) and upon submitting 100 points, unlock a pack of cards. There are only 2 ways users can MTX through the game. While I have a bet going with my friends to see who can perform best without ever purchasing cards for real money, any competitive player will be regularly buying cards. This is obviously the concept Blizzard is wanting to extrapolate – working with the whales. What we need to look at first is the volume discount scaling. If you look below, you’ll see the prices per pack as well as a table showing the prices and how they discount based on scaling volume. The chart above shows the scaling based on the price per pack in volume. There is something important about this! 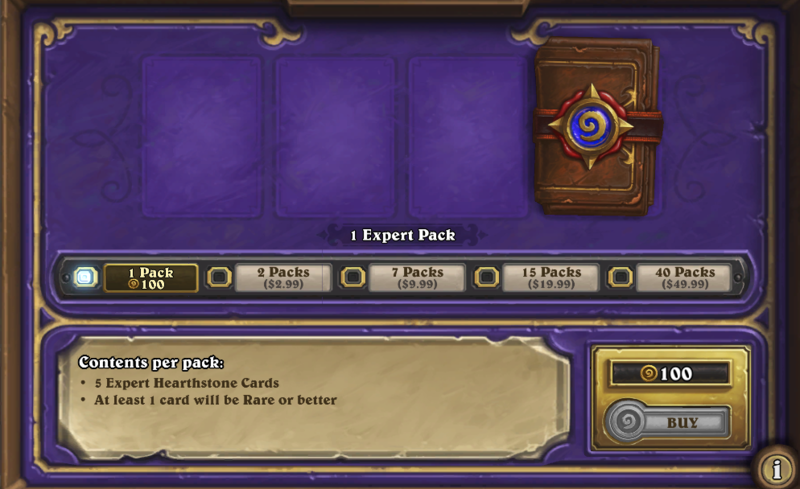 Compared to just buying 2 packs, purchasing 40 packs drops the price by 15% – Blizzard has no desire to significantly compromise the value of their virtual equity just to get users to spend more. Think about this carefully. The desire to upsell a virtual customer a non-existent good should be massive. You are “printing” virtual goods and the only different between 2 packs and 40 packs is making 15x the revenue. Virtual Equity Guarding is an interesting concept because it shows the intended life of a virtual product. By constantly dropping the price to satisfy sales goals you cannibalize your customer’s view of the value of your product. This same concept is evident when the scaling discount from volume is so significant that user’s are dissolutioned about even buying the product because you’re willing to completely change the value of the product just to increase the ARPU. So what happens when you try and put on a sale for a weekend to earn more revenue? Let’s say you’re wanting to experiment with a sales promotion – how do you not undermine your virtual equity guarding? Let’s actually look at what they’ve already been doing. 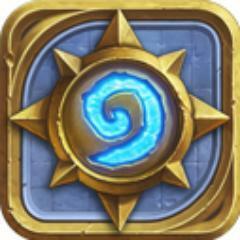 At the time of writing this, HearthStone is nearing the end of its open beta. Throughout the past few weeks, Blizzard has been offering a special reward for anyone who purchases something through the virtual store. Instead of lowering the price of any of their packs, they are increasing the value of any pack. A more accurate way to describe this concept is that Blizzard is solidifying the value of their card packs while compromising on the rarity of one of their cards. HearthStone’s Arena is actually a really innovative idea. I’ve long been waiting for someone to implement an MTX strategy which offers lifetime usability and aims to satisfy the “end game” content problem. The Arena is a users to build random decks of cards with a semi random hero and compete more based on skill rather than cards owned. Evidently, this is a really good idea. If a user isn’t wanting to spend money and buy all the cards, they have the option to compete in a more balanced environment. While the Arena costs 150 game points (you earn free in game) or $1.99 there technically still is a cost barrier which works against the pay wall balancing it gives a really good veteran user a unique game experience that would prevent the game from getting stale. I can’t say enough how well thought through this idea is. Fighting endgame is of paramount need. If a user finds themselves investing a ton of time and money in a game but no longer enjoying it you’re now dealing with buyers remorse or “cognitive dissonance”. The HearthStone Arena gives a really unique approach to dealing with this. Each of the cards in the game could be grouped into various categories based on “potency” or “efficiency” based on their mana cost. Example. Both of these cards cost “1 mana”. Both of these cards have 2 base attack and 1 base health. However, the Leper Gnome deals an extra 2 damage upon it dying. It’s not hard to objectively say the Leper Gnome is a better card to have then the Murloc Raider. In order to acquire the Leper Gnome by crafting, you are required to spend more. This very basic design concept is the foundation of how you create value and a desire to purchase more expensive cards because of their enhanced benefits and value compared to natural cards. Combine this function with the social competitive nature of this game, and you have a social pressure for players to acquire more of the better cards to construct better decks. This competitive tension is pivotal! But here’s the interesting concept – packs of cards are not expensive, but creating specific cards is! Crafting, as mentioned, is how you can create a specific card. By “disenchanting” cards you don’t want, you acquire dust, quantity based on rarity, which can be used to create new cards. Simple – yes. Here’s the costs for crafting and disenchanting the types of cards. A pack of cards purchased 5 cards of which one will be rare or better (I can say that the very standard pack of cards opened has 4 common and 1 rare). This 1 rare card (20 dust) and the other 4 common cards (5 dust) gives a total of 40 dust for each pack of cards opened. This means you have to purchase up to 3 packs just to craft a rare card. This is ignoring the fact most high level decks feature 3 – 5 legendary, 20 epic, and 7 – 5 rare. What a beautiful strategy! The game is presented as having a free entrance, very affordable costs to purchase cards, but very expensive to actually create a professional level deck of cards. Having watched pro players live stream their play, players usually buy upwards of 160 packs of cards ($200) before they can begin to start crafting one complete pro deck of cards. Are you beginning to see why I think HearthStone is an incredibly brilliant business move from Blizzard? 1. Your primary market is the largest and still growing game genre and audience and you can leverage your existing audience and user base. 2. Your ARPU for the average user is going to relatively decent (I’d imagine close to $1.5 monthly) and you have monetization scaling available for whales to spend thousands. The average user is going to want to have good cards and will likely spend money to get them. 3. The game is playable on tablet and mobile devices which makes hardware requirements moot. 4. The potential for cross product advertising is huge! Many of Blizzard’s titles are completely distinct in genre but with enough overlap to market games of relevant content to specific users. HearthStone is going to act as the gateway game, since it has such a massive reach to casual and mobile users, to then look to engage the user base with the other titles of Blizzard. Great post and I agree with your analysis. 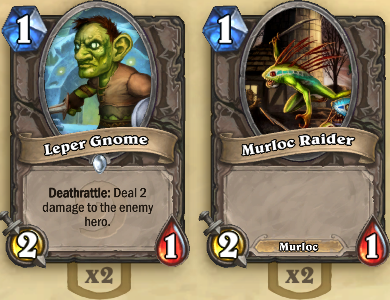 One note: the Leper Gnome isn’t necessarily a “better” card than the Murloc Raider if the deck being built is a “murloc deck”. In other words, a deck that is full of murloc-buffing cards might benefit more from a 1-cost murloc.